Desulfotomaculum nigrificans and D. carboxydivorans are moderately thermophilic members of the polyphyletic spore-forming genus Desulfotomaculum in the family Peptococcaceae. They are phylogenetically very closely related and belong to ‘subgroup a’ of the Desulfotomaculum cluster 1. D. nigrificans and D. carboxydivorans have a similar growth substrate spectrum; they can grow with glucose and fructose as electron donors in the presence of sulfate. Additionally, both species are able to ferment fructose, although fermentation of glucose is only reported for D. carboxydivorans. D. nigrificans is able to grow with 20% carbon monoxide (CO) coupled to sulfate reduction, while D. carboxydivorans can grow at 100% CO with and without sulfate. Hydrogen is produced during growth with CO by D. carboxydivorans. Here we present a summary of the features of D. nigrificans and D. carboxydivorans together with the description of the complete genome sequencing and annotation of both strains. Moreover, we compared the genomes of both strains to reveal their differences. This comparison led us to propose a reclassification of D. carboxydivorans as a later heterotypic synonym of D. nigrificans. In 1965, the genus Desulfotomaculum was created for sulfate-reducing bacteria that form heat-resistant spores . One of the first species that was included in this new genus was D. nigrificans Delft 74, which was originally described as “Clostridium nigrificans” by Werkman and Weaver (1927) . Later, Starkey (1938) renamed it to “Sporovibrio desulfuricans”  before it was finally renamed as D. nigrificans . D. nigrificans is a moderate thermophile that typically grows with fructose and glucose coupled to sulfate reduction [1,4]; without sulfate, only growth with fructose was observed. Utilizing sugars is rare among Desulfotomaculum species. Additionally, D. nigrificans was described to be able to grow with a number of other substrates including lactate, ethanol, alanine, formate, and carbon monoxide (20%) coupled to sulfate reduction [5,6]. Another moderately thermophilic Desulfotomaculum species that can grow with glucose and CO is D. carboxydivorans CO-1-SRB . D. carboxydivorans was isolated from sludge in an anaerobic bioreactor treating paper mill wastewater  and was described to be the first sulfate-reducing bacterium able to grow at 100% CO. D. carboxydivorans converted CO in the presence and absence of sulfate and produced hydrogen during CO conversion. D. carboxydivorans can also grow with glucose. In contrast to D. nigrificans, D. carboxydivorans degrades glucose both with and without sulfate. Phylogenetically, D. carboxydivorans is most closely related to D. nigrificans. However, D. nigrificans is not able to produce hydrogen from CO. Therefore, by comparing the genomes of these strains, the physiological differences might be explained. Here we present a summary of the features of D. nigrificans and D. carboxydivorans, together with the description of the complete genome sequencing and annotation of both strains. Moreover, we compared the genomes of both strains to reveal differences between these phylogenetically very closely related strains. This comparison led us to propose to that D. carboxydivorans is a later heterotypic synonym of D. nigrificans. 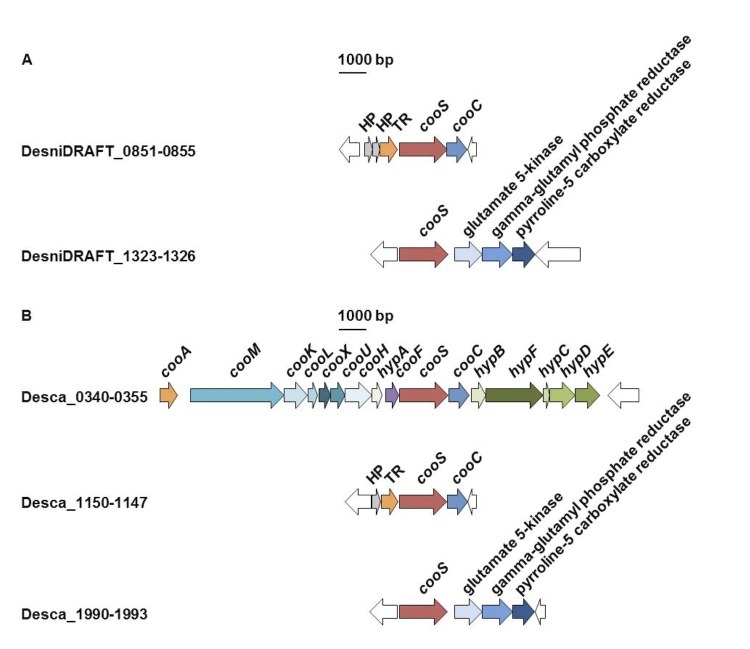 Comparison of the 16S rRNA gene sequences of D. carboxydivorans CO-1-SRB DSM 14880 and D. nigrificans DSM 574 revealed that the two bacteria are highly related (99% sequence similarity). Both strains are part of the Desulfotomaculum cluster 1 subgroup a, together with D. aeronauticum, D. putei, D. hydrothermale, “D. reducens” and D. ruminis (Figure 1). Neighbor joining tree based on 16S rRNA sequences showing the phylogenetic affiliation of Desulfotomaculum and related species divided in the subgroups of Desulfotomaculum cluster 1. DSM 574 and DSM 14880 are in bold type. The sequences of different Thermotogales were used as outgroup, but were pruned from the tree. Closed circles represent bootstrap values between 75 and 100%. The scale bar represents 10% sequence divergence. 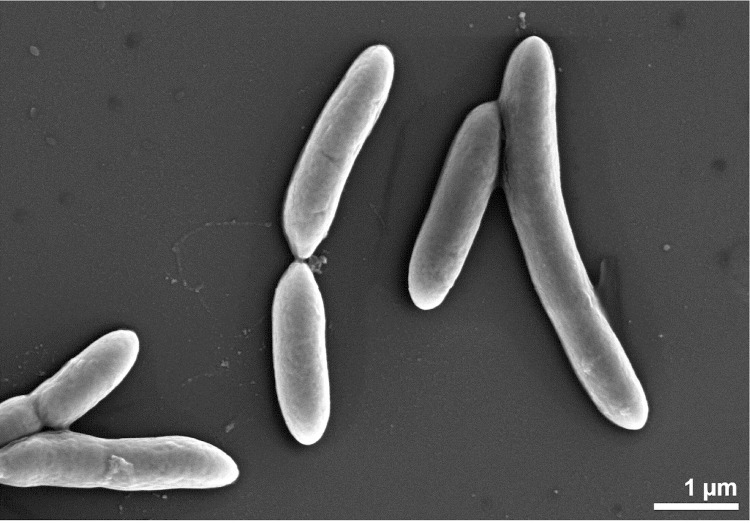 D. nigrificans and D. carboxydivorans are Gram-positive, sulfate-reducing, rod shaped bacteria with rounded ends (0.3-0.5 μm thick and 3-6 μm long ; 0.5-1.5 μm thick and 5-15 μm long , respectively) (Figure 2 and Figure 3). They have a similar temperature range for growth and can both grow optimally at 55°C. Additional similarities can be found in the substrates used for growth. Both D. nigrificans and D. carboxydivorans can grow with fructose, glucose and alanine. These substrates are incompletely oxidized to acetate, coupled to sulfate reduction. Other suitable electron acceptors in addition to sulfate are thiosulfate and sulfite. Neither nitrate nor elemental sulfur are used as electron acceptors. In the absence of an electron acceptor, D. nigrificans is able to grow by fermentation of fructose and pyruvate . Additionally, D. nigrificans has been reported to grow with lactate and ethanol in syntrophic interaction with Methanobacterium thermoautotrophicum . Syntrophic growth of D. carboxydivorans has never been tested. D. carboxydivorans is able to grow in the absence of an electron acceptor with CO (100%), pyruvate, lactate, glucose and fructose . The cellular fatty acid patterns of the two strains were analyzed by Parshina et al. and Krishnamurthi et al. . Both fatty acid patterns are similar and the dominating fatty acids were identified as 16:0, iso 15:0, iso 17:0, anteiso 15:0, 18:0 and iso 16:0. Collins and Widdel  analyzed the respiratory lipoquinone content of D. nigrificans DSM 574 and found MK7 as the predominant isoprenoid quinone. A summary of the classification and general features of D. nigrificans and D. carboxydivorans is presented in Table 1 and 2, respectively. soils, compost heaps, thermal spring water, spoiled foods. rods, rounded ends, sometimes paired. D. nigrificans and D. carboxydivorans were selected for sequencing in the DOE Joint Genome Institute Community Sequencing Program 2009, proposal 300132_795700 'Exploring the genetic and physiological diversity of Desulfotomaculum species'. They are important for their position in subgroup a of the Desulfotomaculum cluster 1. Sequencing the complete genome of the two strains was proposed as it would allow the study of the genetic and physiological diversity within subgroup a. Furthermore, a comparison of the two genomes should reveal the genes involved in CO metabolism and the H2 production in D. carboxydivorans. The genome projects of D. nigrificans and D. carboxydivorans are listed in the Genome OnLine Database (GOLD)  as project Gi03933 and Gc01783, respectively. The two complete genome sequences were deposited in Genbank. Sequencing, finishing and annotation of the two genomes were performed by the DOE Joint Genome Institute (JGI). A summary of the project information of D. nigrificans and D. carboxydivorans is shown in Table 3. Genome sequencing project information of DSM 574 and DSM 14880. Obtain insight into the phylogenetic and physiological diversity of Desulfotomacum species. Obtain insight into the phylogenetic and physiological diversity of Desulfotomacum species, and hydrogenogenic CO conversion. D. nigrificans and D. carboxydivorans were grown anaerobically at 55oC in bicarbonate buffered medium with lactate and sulfate as substrates . DNA of cell pellets was isolated using the standard DOE-JGI CTAB method recommended by the DOE Joint Genome Institute (JGI, Walnut Creek, CA, USA). Cells were resuspended in TE (10 mM tris; 1 mM EDTA, pH 8.0). Subsequently, cells were lysed using lysozyme and proteinase K, and DNA was extracted and purified using CTAB and phenol:chloroform:isoamylalcohol extractions. After precipitation in 2-propanol and washing in 70% ethanol, the DNA was resuspended in TE containing RNase. Following a quality and quantity check using agarose gel electrophoresis in the presence of ethidium bromide, and spectrophotometric measurement using a NanoDrop ND-1000 spectrophotometer (NanoDrop® Technologies, Wilmington, DE, USA). The genome of D nigrificans strain Delft 74 (DSM 574) was sequenced using a combination of Illumina and 454 sequencing platforms. All general aspects of library construction and sequencing can be found at the JGI website . Pyrosequencing reads were assembled using the Newbler assembler (Roche). The initial Newbler assembly consisting of 75 contigs in two scaffolds was converted into a phrap  assembly by making fake reads from the consensus, to collect the read pairs in the 454 paired end library. Illumina GAii sequencing data (3,053.3 Mb) was assembled with Velvet  and the consensus sequences were shredded into 1.5 kb overlapped fake reads and assembled together with the 454 data. The 454 draft assembly was based on 127.9 Mb 454 draft data and all of the 454 paired end data. Newbler parameters are -consed -a 50 -l 350 -g -m -ml 21. The Phred/Phrap/Consed software package  was used for sequence assembly and quality assessment in the subsequent finishing process. After the shotgun stage, reads were assembled with parallel phrap (High Performance Software, LLC). Whenever possible mis-assemblies were corrected with gapResolution , Dupfinisher , or sequencing cloned bridging PCR fragments with subcloning. Some gaps between contigs were closed by editing in Consed, by PCR and by Bubble PCR primer walks (J.-F. Chang, unpublished). Some mis-assembly is still possible in the current assembly that consists in seven contigs and one scaffold. A total of 268 additional reactions and one shatter library were necessary to close gaps and to raise the quality of the final contigs. Illumina reads were also used to correct potential base errors and increase consensus quality using a software Polisher developed at JGI . The error rate of the final genome sequence is less than 1 in 100,000. Together, the combination of the Illumina and 454 sequencing platforms provided 498.0× coverage of the genome. The final assembly contained 332,256 pyrosequence and 37,872,777 Illumina reads. The genome of D. nigrificans and D. carboxydivorans consist of one chromosome of 3,052,787 and 2,892,255 nucleotides with a GC content of 46.28 and 46.63%, respectively (Table 4). Of the 3,112 genes in the genome of D. nigrificans, 98 are RNA genes of which 6 16S rRNA genes. A total of 2,340 genes of the 3,014 protein coding genes are assigned to COG functional categories. The distribution of these genes into COG functional categories is presented in Table 5. The distribution of the 2,174 COG assigned genes of D. carboxydivorans into COG functional categories is also presented in Table 5. Of the 2,844 predicted genes in the D. carboxydivorans genome, 2,747 are protein coding genes and 97 RNA genes, of which 8 are 16S rRNA genes. Both strains have sets of multiple 16S rRNA genes. Within the sets and among the sets most of the genes are 99.5-99.9% identical. Each strain has one differently deviating 16S rRNA gene, the difference probably originating from differential gene loss. In addition, 3.09% of the total genes of D. carboxydivorans are identified as pseudo genes. More genome statistics of D. nigrificans and D. carboxydivorans are displayed in Table 4. Number of DSM 574 and DSM 14880 genes associated with the general COG functional categories. Graphical map of the DSM 574 (upper) and DSM 14880 (lower) chromosome. In both maps one genome was compared to the other. When genes were not similar or present in the other genome it resulted in gaps. The indicated variable regions with their function can also be found in Table 6 and the supplementary data S1. Description of genes present in the variable regions depicted in Figure 4. D. nigrificans and D. carboxydivorans oxidize organic substrates such as lactate, pyruvate, ethanol and sugars incompletely to acetate. Both genomes have gene copies that are predicted to encode L-lactate dehydrogenases (DesniDRAFT_1264, 2906; Desca_0533) and D-lactate dehydrogenase (DesniDRAFT_0054, 1145, 1691; Desca_0863, 2222), which are involved in the oxidation of lactate to pyruvate. For incomplete oxidation of pyruvate to acetate via acetyl-CoA D. nigrificans and D. carboxydivorans have genes encoding a putative pyruvate dehydrogenase (DesniDRAFT_1250, 2504, 1245 and Desca_0770, 0146, 0775, respectively) and subsequently an acetyl-CoA synthetase (DesniDRAFT_2242 and Desca_0484, respectively). Although the two strains cannot grow with succinate, fumarate and malate as electron donors, genes to metabolize these compounds are present in both genomes. D. nigrificans and D. carboxydivorans have genes putatively coding for a fumarate reductase (DesniDRAFT_0617-15 and Desca_1387-89), fumarate hydratase (DesniDRAFT_0612-13 and Desca_1391-92), malate dehydrogenase (DesniDRAFT_0618 and Desca_1386), and a pyruvate carboxylase (DesniDRAFT_1477-78 and Desca_2116-17) that might be involved in the oxidation of succinate, fumarate and malate to pyruvate. For growth on ethanol, both genomes contain alcohol dehydrogenases (DesniDRAFT_0051, 0320, 0326, 0367, 1219, 2126, 2174, 2779; Desca_0375, 0418, 1671, 1913, 1943, 2553, 2558) and acetaldehyde dehydrogenases (DesniDRAFT_0038; Desca_1928). For sulfate reducers to oxidize acetate to CO2, either the complete tricarboxylic acid (TCA) cycle or acetyl-CoA pathway has to be present . Since D. nigrificans and D. carboxydivorans cannot grow with acetate, it was expected neither strain would possess a complete TCA cycle; which was verified by a lack of the putative genes that code for ATP-dependent citrate synthase, aconitase, and isocitrate dehydrogenase. All genes coding for the acetyl-CoA pathway are present in both genomes, except for the genes encoding the acetyl-CoA synthase subunit and the FeS-protein large and small subunit. Probably the gene coding for the acetyl-CoA synthetase is also involved in the acetyl-CoA production from acetate and coenzyme A.
D. nigrificans and D. carboxydivorans are able to utilize glucose and fructose as electron donors in the presence of sulfate. Additionally, both species are able to ferment fructose, although fermentation of glucose is only reported for D. carboxydivorans [5,6]. The capability of utilizing sugars for growth is unusual among Desulfotomaculum species. The other Desulfotomaculum species that belong to cluster I, sub group a, D. ruminis, D. aeronauticum, D. putei and D. hydrothermale (with the exception of “D. reducens”), are not able to grow with glucose or fructose [34-36]. Glucose metabolism in D. nigrificans was studied before . Akagi and Jackson showed that the majority of the glucose was degraded by the Embden-Meyerhof-Parnas pathway and in several instances the glucose followed the Entner-Doudoroff pathway . The Embden-Meyerhof-Parnas pathway and the pentose phosphate pathway are predicted to be complete in the genome of D. nigrificans and D. carboxydivorans. However, genes coding for the 6-phosphogluconate dehydratase and the 2-keto-3-deoxy-6-phosphogluconate aldolase, the two characteristic enzymes of the Entner-Doudoroff pathway, were not found in the genome of D. nigrificans and D. carboxydivorans. A phosphotransferase system (PTS) for glucose-specific transport was not found in either genome. Such a system is present in the genome of the glucose-utilizer D. reducens (Dred_0332). Genes coding for the fructose-specific PTS are present in an operon structure in D. nigrificans (DesniDRAFT_2286 and 2291) and D. carboxydivorans (Desca_2698 and 2703). This system is likely involved in fructose uptake and its subsequent phosphorylation to fructose-1-phosphate. The fructose-1-phosphate thus formed can be further phosphorylated by 1-phosphofructokinase to fructose-1,6-bisphosphate (DesniDRAFT_2290 and Desca_2702). Unlike D. nigrificans and D. carboxydivorans, D. ruminis and D. kuznetsovii are not able to grow with glucose or fructose. However, they have the genes that code for all the enzymes involved in the Embden-Meyerhof-Parnas pathway present in their genome. What is missing in their genome is the PTS for fructose-specific transport. This suggests that the absence of this PTS system prevents the use of fructose for growth. D. nigrificans and D. carboxydivorans can grow with formate plus sulfate in the presence of yeast extract and acetate as a carbon source. Since the genomes lack a complete acetyl-CoA pathway, D. nigrificans and D. carboxydivorans are not able to produce acetyl-CoA from formate and need an additional carbon source. The two genomes have similar genes that putatively code for three formate dehydrogenases (FDHs). The first FDH consists of an alpha subunit (DesniDRAFT_0989, Desca_1018), which is located next to a hydrogenase (DesniDRAFT_0990, Desca_1017) and a flavoprotein (DesniDRAFT_0988 and Desca_1019). The flavoprotein has one predicted transmembrane helix. Therefore, these genes might code for one intracellular membrane associated FDH. The second FDH gene cluster (DesniDRAFT_1389-1392, Desca_2053-2055) putatively codes for a confurcating cytoplasmic FDH. The third is predicted to code for an extracellular FDH (DesniDRAFT_1396-1397, Desca_2059-2060) associated with the membrane by a proposed 10 transmembrane helixes containing protein (DesniDRAFT_1395, Desca_2058). BLAST results and orthologous BLAST analysis  indicate that this transmembrane helix protein is orthologous to cytochrome b. Therefore, electron transport from this FDH might go through cytochrome b.
D. nigrificans and D. carboxydivorans are able to grow with CO in the presence of yeast extract. However, D. nigrificans grows with up to 20% of CO coupled to sulfate reduction, while D. carboxydivorans can grow with 100% CO with and without sulfate. These physiological differences should also be visible in the genome for the genes involved with carbon monoxide dehydrogenase (CODH). Figure 5 shows the organization of the CODH catalytic subunit (cooS) and neighboring genes in D. nigrificans and D. carboxydivorans. D. nigrificans has two cooS genes in the genome (DesniDRAFT_0854 and 1323) while D. carboxydivorans has three (Desca_0349, 1148, 1990). The organization of the cooS and neighboring genes in D. nigrificans is similar to that of two of the cooS and neighboring genes in D. carboxydivorans. However, one cooS gene cluster in the D. carboxydivorans genome cannot be found in the genome of D. nigrificans. The genes in this cluster are similar to genes described to be involved in the H2 production from CO oxidation [38-41]. Carboxydothermus hydrogenoformans was the first bacterium described to have multiple cooS genes, one of which is united in a cluster with hydrogenase genes . The hydrogenase module of this gene cluster represents a membrane-bound energy-converting hydrogenase (ECH) capable of energizing the membrane by proton translocation. Among sequenced Desulfotomaculum species, only D. carboxydivorans, D. acetoxidans, and D. ruminis possess putative genes coding for ECHs. However, in the latter two genomes, ECH encoding genes do not cluster with cooS genes. Earlier analysis showed that clustering of cooS genes and ECH genes is a characteristic feature of hydrogenogenic carboxydotrophs . The presence of the putative ECH-cooS gene cluster in D. carboxydivorans explains its ability to grow hydrogenogenically on CO.
Organization of cooS and neighboring genes in DSM 574 (A) and DSM 14880 (B). Abbreviations: HP, hypothetical protein; TR, transcriptional regulator. In D. nigrificans there are no CODH involved genes in close proximity of the cooS genes, apart from one cooC gene (DesniDRAFT_0855). Apparently, this is sufficient for D. nigrificans to grow with 20% of CO coupled to sulfate reduction. 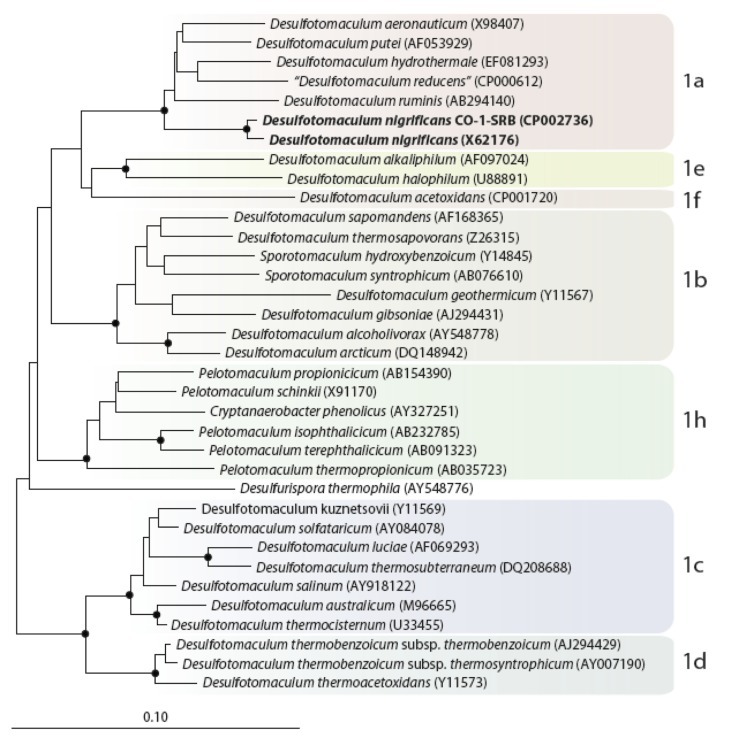 However, D. ruminis, another Desulfotomaculum species in cluster 1a (Figure 1) of which the genome was recently described , also has the cooS gene (Desru_0859) downstream of a transcriptional regulator (Desru_0858) and upstream of the cooC gene (Desru_0860) but that bacterium is not able to grow on CO and sulfate. The reason for this is not yet clear. A cluster of nitrogenase genes (Dtox_1023 to 1030) has been described in the genome of Desulfotomaculum acetoxidans . In the genomes of D. nigrificans and D. carboxydivorans very similar gene clusters occur (DesniDRAFT_0869-0858 and Desca_1134-1144). Notably, in both cases there are cooS genes in the vicinity (DesniDRAFT_0854 and Desca_1148). They are located on another DNA strand and are convergently directed. Since the low-potential carbon monoxide seems to be a good electron donor for nitrogen fixation, this proximity might be more than mere coincidence. This would suggest that small amounts of CO could be oxidized by D. nigrificans in the absence of sulfate. D. ruminis also has a similar gene cluster (Desru_3454-3445). However, in contrast to the genomes of D. nigrificans and D. carboxydivorans no cooS gene is nearby in the genome of D. ruminis. Methyltransferase genes as present in D. kuznetsovii that might point to possible growth with methanol or methylated amines were not found in the genomes of D. nigrificans and D. carboxydivorans. These two strains accordingly, do not grow with methanol. Growth on methylated amines were never tested, but the genome suggests there is no growth possible with these compounds. D. nigrificans and D. carboxydivorans have a similar hydrogenase composition that is dominated by [FeFe] hydrogenases, as observed in other Desulfotomaculum spp. Each of the two bacteria has 9 [FeFe] hydrogenases, divided in the following groups: Three copies of trimeric bifurcating hydrogenases (DesniDRAFT_0775-0777, DesniDRAFT_0770-0772 and DesniDRAFT_1331-1333; Desca_1224-1226, Desca_1230-1232 and Desca_1996-1998); two copies of a monomeric hydrogenase (DesniDRAFT_0646 and DesniDRAFT_0308; Desca_1356 and Desca_1680); one HsfB-type hydrogenase encoding a PAS-sensing domain that is likely involved in sensing and regulation (DesniDRAFT_0986 and Desca_1021); one hydrogenase that is part of a 5-gene operon also encoding one membrane protein and two flavin-dependent oxidoreductases (DesniDRAFT_1073-1077 and Desca_0931-0935); and finally two copies of a membrane-associated hydrogenase (DesniDRAFT_1068-1070 and DesniDRAFT_2001-2003; Desca_0940-0938 and Desca_2453-2455). The catalytic subunit (DesniDRAFT_1068, 2001 and Desca_0940, 2453) of this hydrogenase contains a tat signal motif, which suggests that the hydrogenase complex is positioned extracellular. Moreover, the membrane associated subunit is a 10 transmembrane helix containing protein that is orthologous to cytochrome b. This is similar to the extracellular FDH. The high number of hydrogenases in the genomes of the two bacteria indicate a high metabolic flexibility. This is important for changing growth strategies, from, for example, sulfate respiration to syntrophic growth. A syntrophic co-culture of D. nigrificans and Methanobacterium thermoautotrophicum on lactate and ethanol was described . Syntrophic consortia are able to grow from very small free energy changes due to their ability to overcome thermodynamically difficult reactions. Reverse electron transfer is an essential part of this. The genes coding for the bifurcating hydrogenases and the confurcating formate dehydrogenase in the D. nigrificans genome are therefore likely candidates to be involved in syntrophic growth on lactate and ethanol. A membrane-associated ECH is present only in D. carboxydivorans, as mentioned above, and no other [NiFe] hydrogenases are present. Other membrane associated complexes found in the genome of D. nigrificans and D. carboxydivorans are complex I (DesniDRAFT_0902-0892 and Desca_1110-1120) and a H+-pumping membrane-bound pyrophosphatase (DesniDRAFT_2060 and Desca_2506). The genes for the assimilatory sulfate reduction are organized in an identical way in D. nigrificans and D. carboxydivorans. ATP-sulfurylase (DesniDRAFT_1837, Desca_2237) is followed by adenosine-5´-phosphosulfate (APS) reductase (DesniDRAFT_1836-1835, Desca_2378-2377), and the QmoAB complex (DesniDRAFT_1834-1833, Desca_ 2376-2375). A qmoC gene is absent but seems to be substituted by heterodisulfide reductases (Hdr) CB (DesniDRAFT _1838-1839, Desca_ 2381-2380). This organization is also found in D. ruminis and D. reducens. The position of the HdrCB is switched to the other side in D. acetoxidans, D. gibsoniae, D. alcoholicoviorans, Desulfurispora thermophila, and Desulfarculus baarsii (which owns a Gram-positive aprBA ). In contrast to these organisms, D. kuznetsovii, Ammonifex degensii, Desulfovirgula thermocuniculi, and Gram-negative sulfate-reducing bacteria which posses a Gram-positive aprBA  like Desulfomonile tiedjei and Syntrophobacter fumaroxidans have a complete qmoABC complex (for D. kuznetsovii: Desku_ 1075, Desku_1076, Desku_1078). The genes for the dissimilatory sulfite reductase found and their organization are identical to all other six Desulfotomaculum genomes published so far and most other Gram-positive sulfate-reducing bacteria. The dsrAB genes (DesniDRAFT_2256-2255, Desca_2666-2665) are linked to a dsrD gene (DesniDRAFT_2254, Desca_2664). 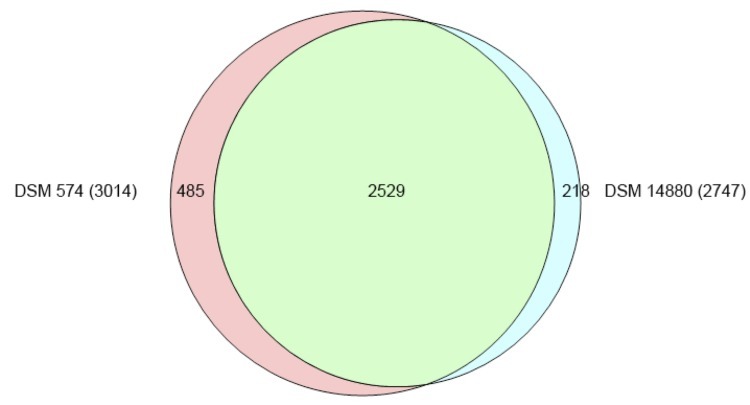 Both organisms also contain a truncated DsrMK complex (DesniDRAFT_2267-2268, Desca_2678-2679) which is linked to a dsrC gene (DesniDRAFT_2266, Desca_2677) as it was found in D. ruminis . This truncated DsrMK is generally found in Gram-positive sulfate-reducing bacteria and not restricted to members of the genus Desulfotomaculum. D. nigrificans and D. carboxydivorans lack nitrate reduction genes for reduction of nitrate to N2. Nitrate reductase, nitric-oxide forming nitrite reductase, nitric-oxide reductase and nitrous-oxide reductase are all absent in both genomes. However, a nitrite/sulphite reductase (DesniDRAFT_1001, 2506; Desca_0162, 1181) and an ammonia forming nitrite reductase (DesniDRAFT_0204; Desca_2313) are present in the genome of D. nigrificans and D. carboxydivorans. No taurine degradation pathway was detected in the genome of either strain, but it was described for the closely related D. ruminis . Using fumarate as an electron acceptor for growth of D. nigrificans and D. carboxydivorans has not been tested yet. However, a fumarate reductase is present in the genomes of the two bacteria. 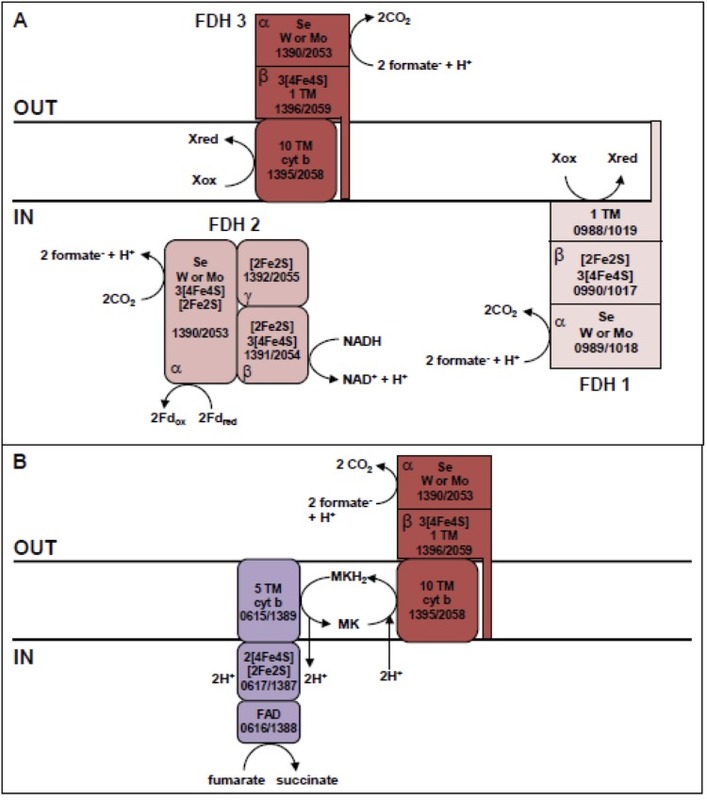 The three genes encode for a FAD containing catalytic subunit (DesniDRAFT_0617; Desca_1387), an iron sulfur containing subunit (DesniDRAFT_0616; Desca_1388), and a membrane associated cytochrome b (DesniDRAFT_0615 and Desca_1389). This cytochrome b protein might perform an electron interaction with the cytochrome b of the extracellular FDH (Figure 6, panel B). This interaction could occur as described in Wolinella succinogenes, where fumarate can be used as an electron acceptor for growth on formate . Schematic representation of putative formate dehydrogenases in the genome of DSM 574 and DSM 14880 (A). Including the hypothesized electron interaction of the putative extracellular membrane bound formate dehydrogenase with the putative fumarate reductase (B). The electron acceptor fumarate is reduced to succinate by using formate as an electron donor. Gene locus tag numbers and α-, β-, and γ-subunits are depicted. Moreover, predicted iron-sulfur clusters and other metal-binding sites are indicated. To reveal genomic differences between these two very closely related species, a bidirectional BLAST of the protein coding genes was performed. BLAST analyses were performed using standard settings and best hits were filtered for 70% sequence coverage and 40% identity (supplementary data S1). A total of 2,529 homologous genes were found (Figure 7). The distinct genes were screened for operon structure and function, revealing genes involved in CRISPR, urea metabolism and hydrogenogenic CO metabolism in D. carboxydivorans. Venn diagram showing a comparison of the protein coding genes of DSM 574 and DSM 14880. The number of overlapping protein coding genes is given inside the areas of the circles and the total number of derived protein sequences used for each strain is shown in parentheses. The figure was created using the program Venn diagram plotter available from the Pacific Northwest National Laboratory Software Distribution Center . 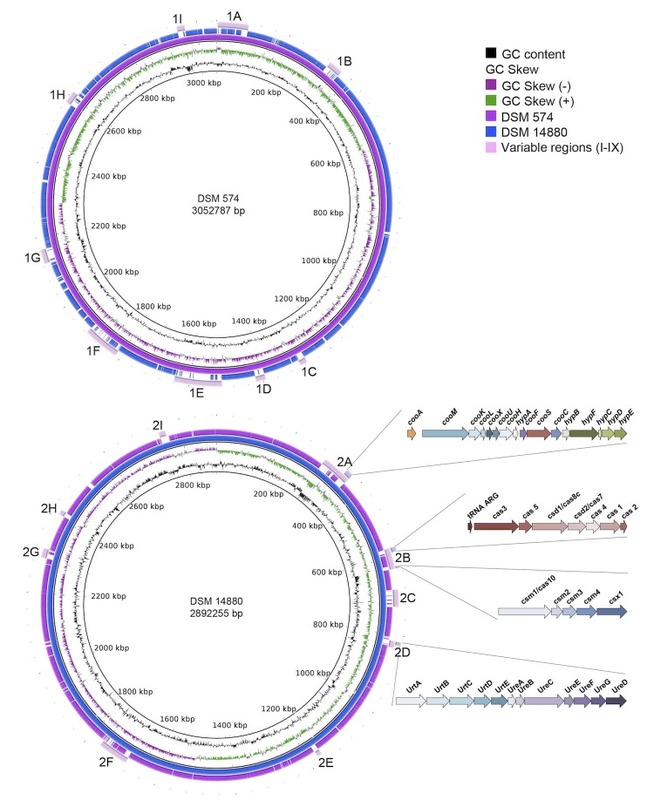 CRISPR genes in D. carboxydivorans were found to have low sequence coverage and or identity with genes in the D. nigrificans genome (Figure 3). These genes involved two CRISPR-Cas systems, which we classified as a I-C subtype (Desca_0534-0540) and a III-A subtype (Desca_0572-0576). D. nigrificans has one CRISPR-Cas system subtype, I-A (DesniDRAFT_2444-2452), which is also present in D. carboxydivorans (Desca_0726-0734). The presence of multiple CRISPR-Cas systems and the occurrence of the different subtypes in one strain has been described previously [49,50] and shows that the co-occurrence of subtype I-A with I-C and III-A is a common feature. 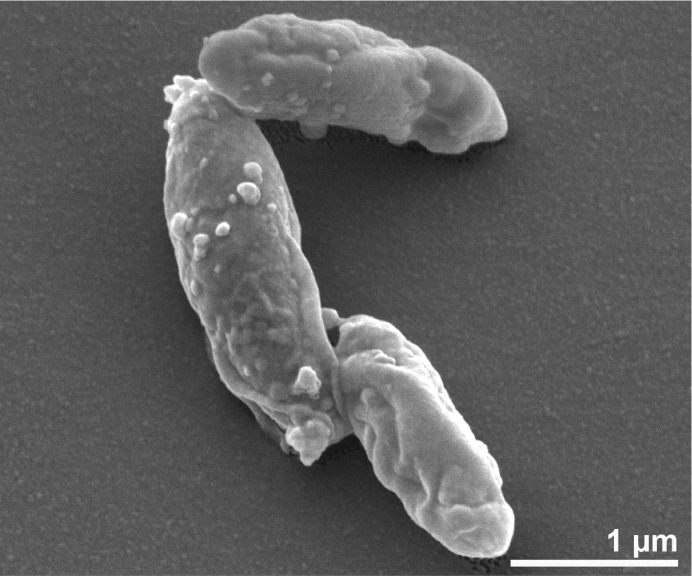 However, it also shows that D. carboxydivorans is part of the 2% of bacteria that have a III-A subtype without a III-B subtype. The genome of D. carboxydivorans also contains genes coding for a urease (Desca_0743-0749) and urea transport (Desca_0738-0742) (Figure 3). Urease catalyzes the reaction of urea to CO2 and ammonia. Urea is very common in the environment and is a nitrogen source for many bacteria . The genome of D. nigrificans lacks the genes coding for an urease, which indicates that D. nigrificans is relatively more restricted regarding its nitrogen source. Other interesting genes that are present in the D. carboxydivorans genome and not in the D. nigrificans genome are genes involved in the carbon monoxide dehydrogenase (CODH) and hydrogenase as described above. The overall similarity of the genome sequences of the type strains of D. nigrificans and D. carboxydivorans was estimated by using the Genome-To-Genome Distance Calculator (GGDC) as described previously . This program calculates DNA-DNA similarity values by comparing the genomes to obtain high-scoring segment pairs (HSPs) and inferring distances from a set of three formulas (1, HSP length/total length; 2, identities/HSP length; 3, identities/total length). According to the GGDC the average estimated DNA-DNA similarity value between the two type strains is 86.5 ± 5.5% and thus clearly above 70%, which is the widely accepted threshold value for assigning strains to the same species . The high similarity of the genome sequences of both type strains was further supported by the average nucleotide identity of shared genes (ANI), which proved to be above 99%. This ANI value is much higher than the 95 to 96% value shown to correspond to the 70% DNA-DNA hybridization level . Moreover, the two strains have almost identical 16S rRNA gene sequences (>99%) and a high number of shared genes (Figure 7). It should be mentioned that the previously reported and deposited rRNA gene sequence of D. nigrificans DSM 574 contained a lot ambiguities and some missing nucleotides, which are counted as mismatches by BLAST. Therefore, we reanalyzed the rRNA gene sequences of D. nigrificans deposited in the NCIMB culture collections and confirmed the identity of the rRNA gene sequence found in the genome of DSM 574. We propose that the species should be united under one name. According to the rules of priority as given by the Bacteriological Code  the name D. nigrificans should be used for the unified taxon, with D. carboxydivorans as a later heterotypic synonym. The description is as given by Campbell and Postgate  and Parshina et al. with the following modifications. The cells are Gram-positive, rod-shaped with rounded ends, 0.3-1.5 x 2-15 µm, single or sometimes paired. Motility with tumbling or twisting movements conferred by peritrichous flagella. Terminal or subterminal oval endospores that are slightly swelling the cells. Thermophilic and neutrophilic with an temperature optimum of 55°C. NaCl is not required for growth. The following substrates are utilized, coupled to the reduction of sulfate to sulfide: DL-lactate, pyruvate, ethanol, L-alanine, D-fructose, D-glucose. Acetate and methanol are not utilized. Substrates are incompletely oxidized to acetate. In the presence of 0.5 g/l yeast extract, lithoheterotrophic growth is possible, such as growth on H2 and CO2 with sulfate or growth on 20% CO with sulfate for D. nigrificans strain Delft 74 and growth on 100% CO with or without sulfate for strain CO-1-SRB. Suitable electron acceptors with lactate as substrate are sulfate, sulfite and thiosulfate, but not elemental sulfur or nitrate. Fermentation of pyruvate and fructose; strain CO-1-SRB is also able to ferment DL-lactate, glucose and CO. The prevalent respiratory lipoquinone is MK7 with only small amounts of MK6. The dominating cytochromes are of type b. Major cellular fatty acids are 16:0, iso 15:0, iso 17:0, anteiso 15:0, 18:0 and iso 16:0. The DNA G+C content is around 46 mol%. The type strain is Delft 74 (=NCIMB 8395 = DSM 574 = ATCC 19998 = NBRC 13698). We would like to gratefully acknowledge the help of Christine Munk and Megan Lu for finishing the genome sequence (both at JGI). The work conducted by the U.S. Department of Energy Joint Genome Institute is supported by the Office of Science of the U.S. Department of Energy under Contract No. DE-AC02-05CH11231, and was also supported by grants CW-TOP 700.55.343 and ALW 819.02.014 of the Netherlands Science Foundation (NWO) and grant 323009 of the European Research Council. Zhou Y, Landweber LF. BLASTO: a tool for searching orthologous groups. Nucleic Acids Res 2007;35(Web Server issue):W678-82. Staals RHJ, Brouns SJJ. Distribution and Mechanism of the Type I CRISPR-Cas Systems. In: Barrangou R, van der Oost J, editors. CRISPR-Cas Systems: Springer; 2012. p 145-96. In: Lapage SP, Sneath PHA, Lessel EF, Skerman VBD, Seeliger HPR, Clark WA, editors. International Code of Nomenclature of Bacteria: Bacteriological Code, 1990 Revision. Washington (DC)1992.